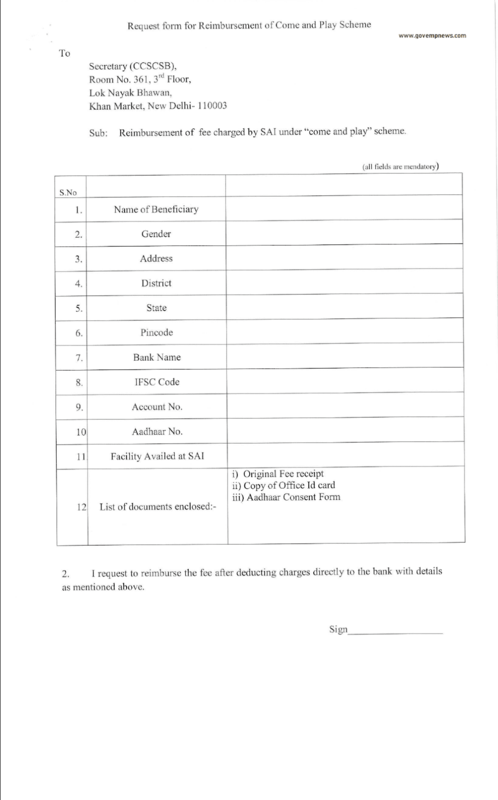 Home DOPT DOPT ORDERS Reimbursment of Sports Facilities Charges under Come & Play scheme for Central Government Employees & their dependent family members in Swimming (at Talkatora Stadium), Badminton, Table tennis and Fitness Centre. Reimbursment of Sports Facilities Charges under Come & Play scheme for Central Government Employees & their dependent family members in Swimming (at Talkatora Stadium), Badminton, Table tennis and Fitness Centre. The Central Civil Services Cultural & Sports Board (CCSCSB) under administrative control of the Department of Personnel & Training (DOPT), a nodal agency for promotion of Cultural & Sports activities amongst the Central Government Employees in the country, had started a scheme for use of Sports facilities of Authority of India under their Come & Play scheme in Swimming (at Talkatora Stadium). Badminton, Table tennis and Fitness Centre for Central Government Employees & their dependent families members. The details of the Come & Play Scheme are available at http: www.sportsauthorityoffindia.nic.in – Schemes – Come and Play Scheme. 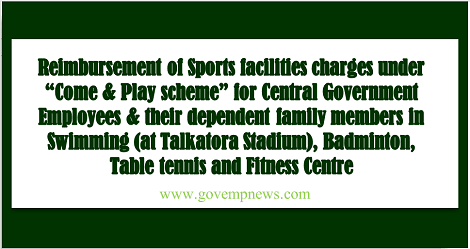 Under the scheme, the Central Government Employees & their dependent family members may use sporting facilities for Swimming (at Talkatora Stadium), Badminton, Table Tennis and Fitness Centre (excluding Sauna Facility) of the Sports Authority of India (SAI) at their rates (on monthly basis) or rates available for Central Government employees and their dependent family members, whichever is lower.